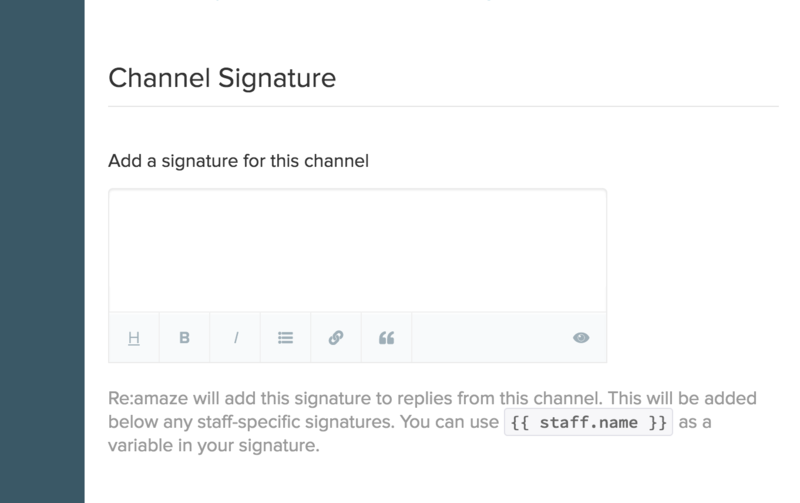 To understand how personal and channel signatures work for email in Re:amaze, you'll first need to understand how email channels work in Re:amaze. We recommend reading this article before proceeding. 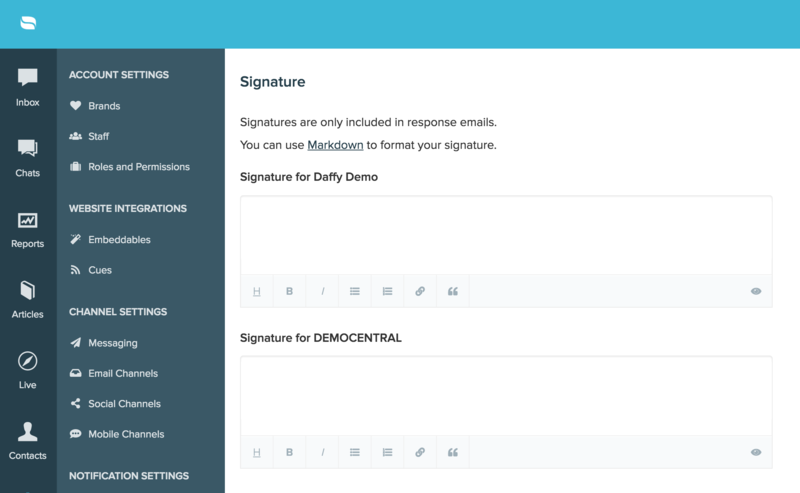 Note: Signatures are used only for email channels and not for social, SMS, or live chat channels. Your signature is one of the most important elements of your staff profile. If you're going to be using the Re:amaze dashboard or mobile app in the future to respond to customer conversations, your Re:amaze signature will override the signature you currently have in your regular email account. If your Re:amaze account is multi-brand capable, you have the option of adding an individual staff signature for every brand. In the case of running customer service for multiple businesses, this makes it immensely easy for staff members so they don't have to switch signatures on the fly. The same applies to channel signatures. Because email channels belong to brands, each channel can have its own channel signature. To set up your personal signature, go to "Settings" >> "Personal Settings" >> "Signature"
When you reply as a staff member, your personal staff signature is automatically appended to the end of your message. Personal signatures are just that, personal. They vary from staff to staff. However, channel signatures belong to the email channel and are applied to every staff member when they respond to customers. Channel signatures appear underneath staff signatures. To set up your email channel signature, go to "Settings" >> "Email Channels" >> "Channel Signature"
Note: If a staff member prefers to override the Re:amaze personal email signature with their Gmail or Outlook signature, they can opt to check the "Email Passthrough" option.